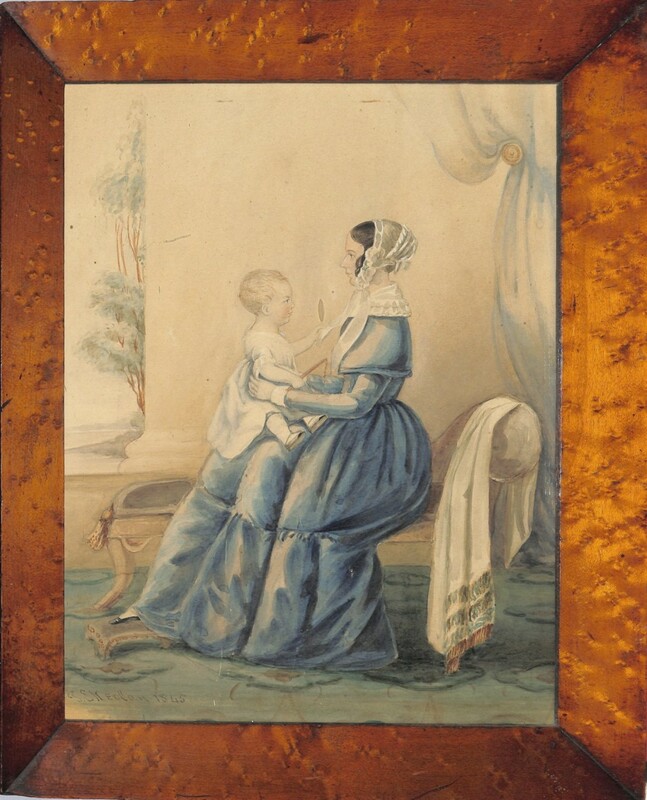 On offer is a most pleasing watercolour portrait of a young mother seated on a chaise longue with her baby on her lap. 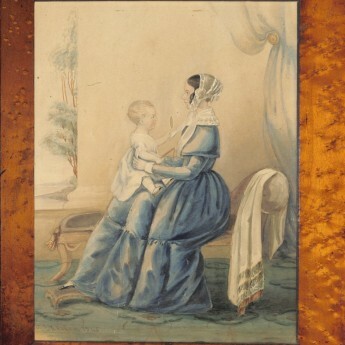 The lady is wearing a blue dress, a white cap with long ribbon ties and dainty black shoes. Her fringed shawl lies over the end of the chaise. 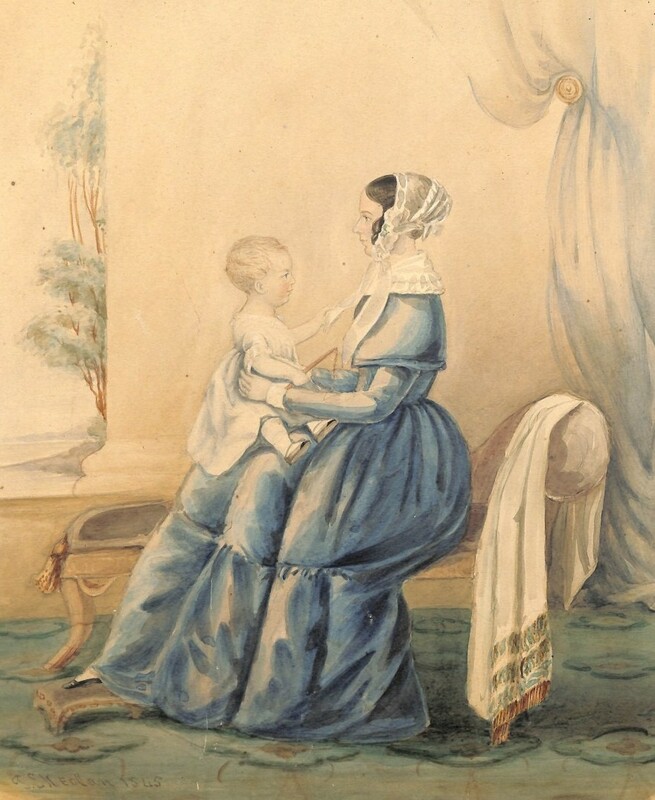 The child, wearing a white short-sleeved dress and buckled shoes, is brandishing a tiny toy whip and playing with the ribbon on his mother’s cap. Watercolour signed and dated ‘P. 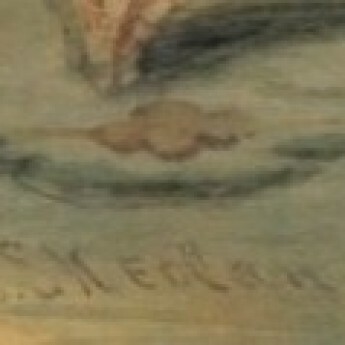 Skeolan 1845’. It is presented in a handsome bird’s eye maple veneer frame with old bubbly glass. Excellent condition. Born in Galway in Ireland, Peter Skeolan was a silhouette and portrait artist before trying his hand at photography. At one time he had a studio in Commercial Street in Leeds that overlooked the ticket platform at the railway station. In the window he kept a large parrot that could apparently imitate the guard’s whistle and would cry out “Stop! I’ve lost my ticket” in an agonised female voice, chuckling at his own joke. The parrot knew the porters by name but the comments became so ribald the cage and parrot had eventually to be removed. Skeolan died in Leeds in December 1871.